Do you know What is FSAE ? Have you ever heard about this event? If the answer is NO, then this is for you. Well, suppose you are a college student and you have interest and potential of making a formula car then this event organized by Society of Automotive Engineers (SAE), provides you a platform to showoff your creativity, idea’s and potential on an international level and to compete against the best team’s in the world. The concept behind Formula SAE is that a fictional manufacturing company has contracted a student design team to develop a small Formula-style race car. The prototype race car is to be evaluated for its potential as a production item. The target marketing group for the race car is the non-professional weekend autocross racer. Each student team designs, builds and tests a prototype based on a series of rules, whose purpose is both ensuring on-track safety (the cars are driven by the students themselves) and promoting clever problem solving. 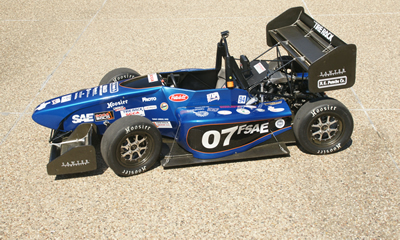 Formula SAE encompasses all aspects of a business including research, design, manufacturing, testing, developing, marketing, management, and fund raising. Formula SAE takes students out of the class room and puts them in the real world. Big companies, such as General Motors, Ford, and Chrysler, can have staff interact with more than 1000 student engineers. Working in teams of anywhere between two and 30, these students have proved themselves to be capable of producing a functioning prototype vehicle. Today, the competition has expanded and includes a number of spin-off events. Formula Student is a similar SAE-sanctioned event in the UK, as well as Formula SAE Australasia (Formula SAE-A) taking place in Australia. A Formula SAE West event takes place in California but will be replaced by SAE Lincoln in Nebraska for 2012. The Verein Deutscher Ingenieure (VDI) holds the Formula Student Germany competition at Hockenheimring. So, I think now you have a better idea of what FSAE is all about. Now as I am a team member of PRAVEGA RACING (FASE team of VIT University,India), your queries and opinion are most welcome.